Forget the $140 billion bailout package, the Fed will throw as much as ten times that at the credit crisis so as to meet the requirements of the political establishment of having done everything within its power to deliver the most favorable election conditions possible, even going so far as to mail out several checks to every US tax payer, starting with announced $600 'tax rebate'. The objective is to DELAY the impact of the recession until AFTER the November US election. The 1970's stagflation was sparked by the then Fed Chairman Arthur Burns in 1972 printing money to ensure his master, the Republican President Nixon was re-elected. This was exacerbated by the oil crisis, and later in the decade was not helped by Jimmy Carters clueless appointment at the helm of the Fed which had the effect of making Nixon's inflation far worse. If Jimmy Carter had, had a competent Fed chairman other than Miller, then Ronald Reagon may never have made his curtain call. However the damage had been done and Carter was forced by the ' Wall Street establishment' to appoint Paul Volcker as the Fed Chairman, unfortunately under Jimmy Carter he had to serve two masters and hence the US remained in stagflation into the November 1980 election as the printing presses were running in an attempt to stave off the Democrats defeat. 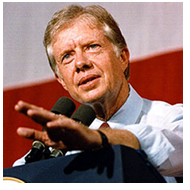 Jimmy Carter may even have stood a chance of winning had it not been for the Iranian Ayatollah's interference in the US election. 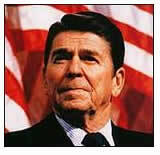 It was only after the 1980 election and Ronald Reagon's republican victory that the fight against inflation began. Paul Volcker seized the moment to push Interest rates up sharply which pushed the US and much of the world into a deep recession. There was plenty of time until the 1984 election by which time the money supply printing presses would once again flow at full speed to ensure Ronald Reagon's re-election. The price of which was a burgeoning debt mountain as the Great Communicator left the US with a national debt of $3 trillion up from $700 billion. Do you see a pattern here yet ? The role of the Fed is not primarily to fight inflation, but to deliver the conditions conducive towards an election win for the incumbent party. That role supercedes all others, as we are again witnessing today. The implications are clear, that those anticipating that the US is already in a recession may find themselves scratching their heads all the way into the November election, as the already manipulated economic statistics increasingly paint a more favorable economic picture as the Fed continues to drive interest rates lower and flood the financial markets with as much liquidity as the banks require to stay afloat. Even the US housing market may find a brief respite, by amazingly clocking up several months of rising prices this summer with housing market consensus consequences shifting towards a potential housing bottom. However the downtrend is expected to re-assert itself following the US election. What if the Fed Succeeds and the US Avoids Recession 2008 ? Then whoever wins the November election, (which at this time strongly favors a Democrat) will let the Fed do its job of priming the US economy for the NEXT elections in 2010 (mid-term) and the presidential election in 2012. The strategy presented will be clear for immediate sharp economic pain with Fed policy going into reverse on interest rates, much as Paul Volcker acted following Ronald Reagon's election in 1980. Interest rates will be raised sharply and the US and much of the western world will enter into a recession with the objective of eliminating inflation. However contrary to many analysts, I don't see today's situation quite on the same scale as the 1970's STAGFLATION which was left to fester for some 8 years and thus subsequently required a much harsher response than today's INFLATION requires, therefore there interest rates are not expected to be hiked to anywhere near the levels seen during the early 1980's. What if the Fed Fails and there is a Recession ? Then the Democrats will win, and the republicans will be blamed for the recession during 2008-2009, as the Democrats subsequently take the credit for defeating inflation during 2009 and the subsequent years of economic growth. Commodity Bulls may find that their bubbles are shortly about to be burst. As the worlds central banks having followed the US Fed into inflation will follow the US Fed into its fight AGAINST inflation. The Emerging markets will undoubtedly continue to demand commodities at an ever faster pace and therefore any decline would suggest to be a temporary, perhaps a bear market spanning between 12 to 18 months rather than the 20 years of deflation that we saw following the 1980's peak. The market tends to act ahead of the curve, so despite rising inflation into the US election, we may actually see a peak in commodities much sooner than November 2008. Outlook for the Bond Markets. Sharply higher interest rates implies sharply lower bond prices, at least in the initial phase as it will take time for inflation to leave the statistics from the surge going into November 2008. The implication of a delayed recession suggests that stock prices will rise as the economic news coupled with the intention of the central banks money supply printing presses running at full stream with ever larger bail out packages announced to support economic activity and consumer spending. This in an atmosphere for the expectations of an imminent recession will be taken as bullish news for a quarter or two at least. Again the hangover of which will follow the November election as the delayed recession starts to bite deep into corporate earnings during 2009. 03 Mar 08, 21:24 This will not work..
What are people thinking here? I mean throwing money into the ecommy that is already down, why? Because of a war we are spending Billions of dollars on. Whoever wins the election for 2009 has a big task to boost this ecommy back. Giving people money free from the Goverment will not help. Presdent Bush is doing just that; it seems to me he thinks giving people 600-1,300 dollars for free people will spend this money. I'm sorry to tell you this will not help, people will use credit cards and save the money. Whoever is in Washigton,DC in 2009 needs to bring home the troops and cut the National spending so Education, Poor people and other things that are effecting the United States can be sloved. In closing, I would like to add that United States needs to take of problems here than work on other countries. The US spends more money on medicaid and medicare than the occupation of Iraq and Afghanistan. Only slightly more, but more.